The key to keeping the corn succulent when cooking it on the barbecue is to soak the whole corn cobs in water before you start cooking. This lets the corn steam inside its husk resulting in some super juicy corn ready to be lathered in butter… told you it would be the sexiest corn at the party! After you soak the corn cobs for a few hours (or overnight if possible), pop the corn on the barbecue and cook for 10-15 minutes, turning regularly, until the husks are charred all over. Let the corn cool until it is easy to handle. Peel back the husk of the corn. Separate the husks into three sections at the base of the cob and use those sections to plait the husks. The plaited husks not only look great, they provide your guests with a novel way to hold onto their cooked corn. 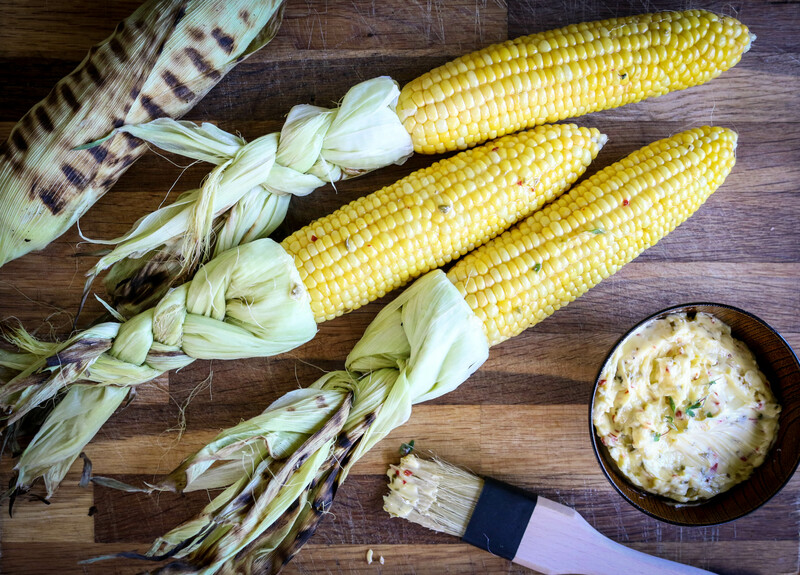 Brush the corn with chilli butter and enjoy!